No longer receiving emails upon form submssion. We are no longer receiving an email when someone submits a form to us. Has there been a change to how this is handled? We have also checked our spam folders, but they are nowhere to be found. Also, on form 23106116198954 your email alert appears to be missing the Sender Email Address. 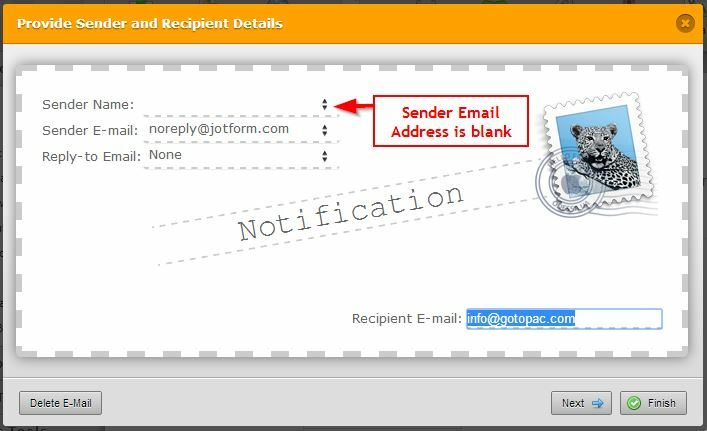 This may cause some email service providers to reject the email alert, thus adding your email address to the bounce list. To help you better. do tell us which form you are referring to. Do let us know if you need further assistance. Thank you.